At least 40 people have been killed after a tsunami caused by a volcanic eruption hit beaches in Indonesia. The wave hit beaches around the Sunda Strait late on Saturday night. The country's Disaster Mitigation Agency confirmed around 600 people have been injured. A tsunami alert was issued and people in low-lying areas fled to higher ground. Indonesian officials believe the tsunami was caused by an eruption on nearby Krakatoa, which has been spewing volcanic ash into the air. The Australian Bureau of Meteorology has been monitoring the situation and has issued a red warning to airline pilots operating in the region that an ash cloud is spreading south west from the volcano to an altitude of 55,000 feet. It is believed the tsunami was caused by an undersea landslide following the eruption of the Krakatoa volcano. It is understood the wave hit beaches on the Sunda Strait - between the islands of Java and Sumatra. In September, at least 832 people were killed by a quake and tsunami that hit the city of Palu on the island of Sulawesi, which is just east of Borneo. A volcanic eruption in Krakatoa in 1883 was one of the deadliest in recorded history killing more than 36,000 people. A video circulating on Twitter shows a two-foot high wave washing ashore. Later photographs show cars overturned and buildings destroyed. However, local media said Indonesian authorities warned coastal areas could be hit by 7-foot high waves. 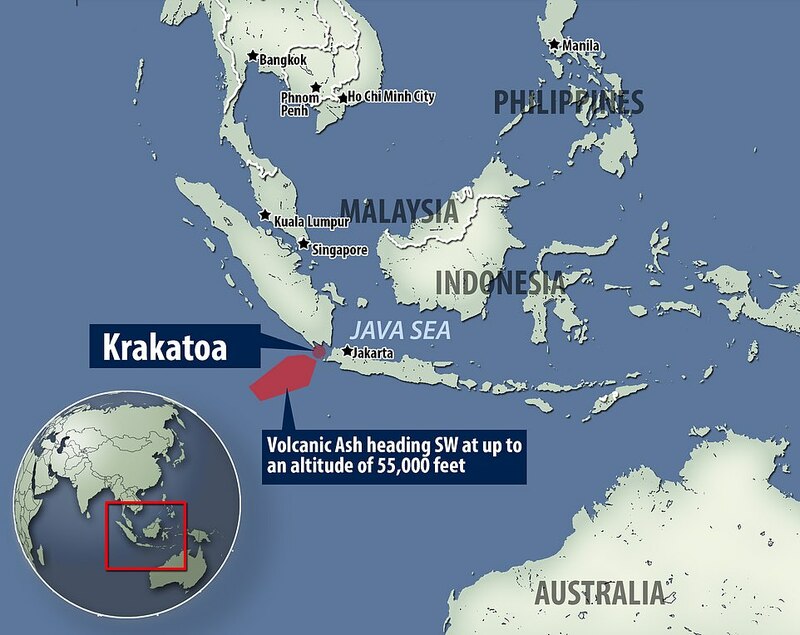 The Meteorology and Geophysics agency in a separate statement said it could have been caused by undersea landslides from the eruption of Anak Krakatau, a volcanic island formed over years from the nearby Krakatau volcano. It also cited tidal waves caused by the full moon. 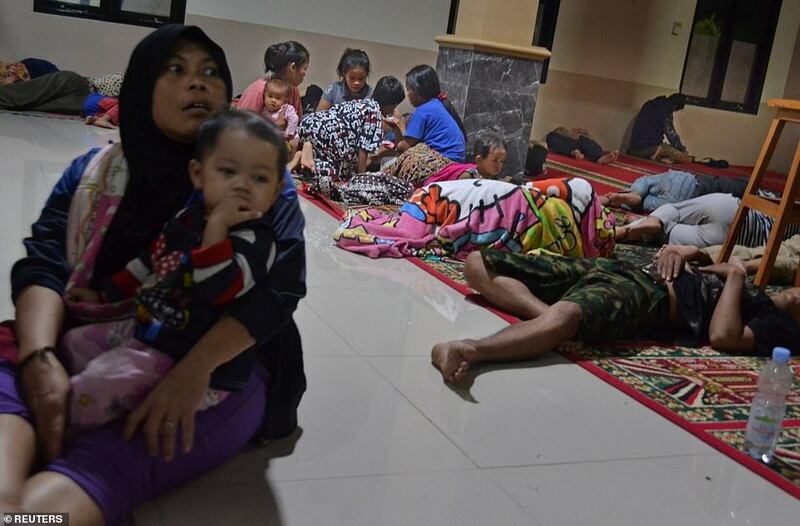 The number of victims is likely to increase because not all affected areas have been assessed, said disaster agency spokesman Sutopo Purwo Nugroho. He said he had been taking photographs of the eruption on Krakatoa when the wave struck. Soputan Volcano in Sulawesi, Indonesia . Krakatau volcano eruption in Indonesia 2018. Eruption of Anak Volcano Krakatau in Indonesia, impressive sound of volcano strength. Krakatoa, or Krakatau is a volcanic island situated in the Sunda Strait between the islands of Java and Sumatra in the Indonesian province of Lampung. I don’t know how much magma is needed for this amount of CO2 release from Katla volcano. What I do know is that it is not little amount of magma inside Katla volcano. The Alaska Volcano Observatory raised the alert level on Mount Veniaminof last week after satellite imagery showed low-level ash emissions emanating from the volcano’s caldera. The alert level was raised from green to yellow on September 3rd after increased seismic activity was detected and raised further the next day to orange after ash was detected. Veniaminof, an 8,225-foot stratovolcano is one of the largest and most active volcanos in the Aleutian arc. 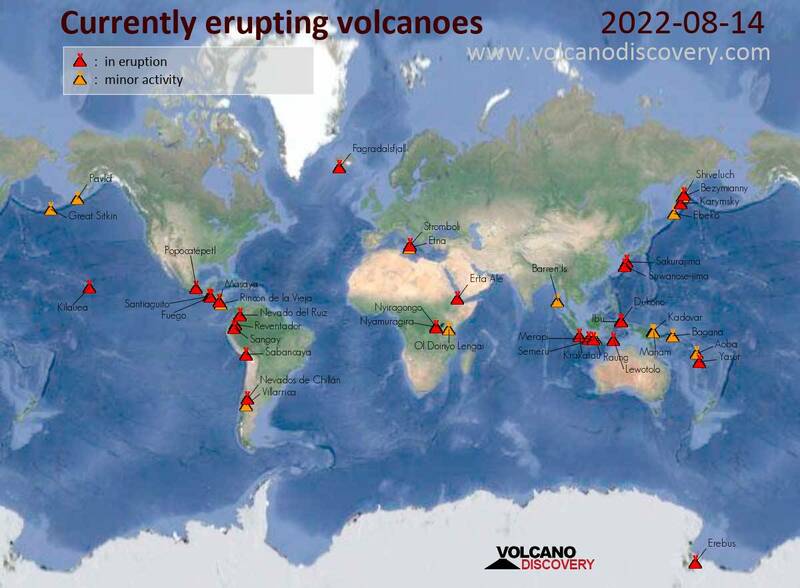 In the past 200 years, the volcano has erupted at least 13 times. Passengers on the Tustumena spotted lava flowing and fountaining from the volcano as it transited the area traveling from Sand Point to Chignik on Monday. An island volcano on the north coast of Papua New Guinea erupted early on Saturday, forcing 2,000 villagers to flee from lava flows. Three villages were directly in the path of the lava flow and residents had to be evacuated to safer ground. 'The most affected areas are Baliau and Kuluguma and due to the very poor visibility caused by the ash fall, people are using torch light to move around,' it said. 'There are no casualties as far as we know but we are telling people to keep away from valleys for risk of mud flows. There's a heavy thick blanket of ash on the flank and if there is heavy rainfall, we are making people aware of the threat,' he said by phone. Saunders said the initial phase of the eruption was over but a new vent had opened, indicating more activity may be likely. Manam Island, just 10 km (6 miles) wide, is one of the Pacific nation's most active volcanoes and is home to roughly 9,000 people. The Darwin Volcanic Ash Advisory Centre (DVAAC) issued a threat warning to aviation to reroute around the cloud, which was above the cruising level of commercial airlines. Etna presents a rising summit activity for the past few days, with Bocca Nuova's nighttime glow and Strombolian explosions at the NSEC. In the crater Bocca Nuova, strombolian activity of the mouth BN-1 is increasingly important. In addition, in the south-eastern part of Nuova Bocca, on August 16, the mouth BN-2 opened, after being inactive since December 2015; it produces intense degassing with high temperatures alternating with strombolian activity which remains confined for the moment inside the crater. An eruption occurred at Anak Krakatau on August 23, 2018 at 18:07 WIB. It is characterized by a black ash plume 700 meters high above the crater (1.005 m asl. ), a duration of 31 seconds and a maximum amplitude of 27 mm on the seismogram. The alert level remains at 2, with a forbidden area of ​​2 km radius around the crater. G Peru reports intense ash emissions on August 23 at Sabancaya; they disperse to the northeast and east over 80 km, and are accompanied by a plume rising to 4,000 meters in height. The Devil's Woodyard mud volcano erupted on August 21 shortly after the M 6.9 earthquake that rocked Trinidad & Tobago. Residents close to the site heard muffled sounds coming from it. At least eight active cones ejected mud near the vents and the gas outlet was observed, especially constant from the central vent. A new step fracture has been noted. According to Professor R. Robert Stevenson, director of the UWI seismic research center, there is a possible connection between seismic activity and that of mud volcanoes, to be verified before affirming it.